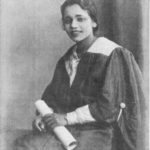 Kenrick Reginald Hijmans Johnson never finished his studies at the University of Edinburgh. Alas, his alumnus status at the University of Edinburgh is contested. While it may be common knowledge that he matriculated at the University, searching for his matriculation records in the university’s archives and the Royal College of Surgeons and Physicians in Edinburgh has yielded no results: Ken Johnson is not recorded to have studied at either institution. While Ken Johnson’s educational background remains a mystery, there are detailed accounts of the last decade of his life, presumably starting right after he abandoned his studies, around 1931. Johnson was the son of the Minister of Health in British Guiana and was sent to the UK as a student (Matera 2015, p.12). However, he had a passion for jazz and entertainment, which he chose to pursue over his father’s desire that he continue the family medical tradition. By the time he died in 1941, he had established his name as Britain’s first black swing band leader. Had he not died at the early age of 26, Grace Baird states, Ken ‘Snakehips’ Johnson would have changed the British music industry even more fundamentally than he actually did in his few years of activity in the eye of the jazz audiences and music critics (Baird 2010). This short biographical sketch will also look at Ken’s impact on the black communities of solidarity that formed around marginalised artists at the time, a phenomenon outlined by Matera (Matera 2015). Johnson’s impact on the jazz industry cannot be separated from his blackness. His musical efforts are to be situated in the context of black internationalism and Pan-Africanism that shaped Black London in the 1930s (Matera 2015). From the formation of his first jazz band in Trinidad, Johnson chose to only work with Black Caribbean band members. Despite being a trained swing dancer, rather than a trained musician, Ken “Snakehips” Johnson led black-only orchestras to fame. His enthusiastic leadership made up for his lack of musical expertise, as he himself stated in an interview with Una Marson from 1940, on the latter’s BBC programme Calling the West Indies (BBC, 2018). He first became famous with the band Emperors of Jazz, founded in 1936 with fellow jazz star Leslie Thompson. In the years leading up to his breakthrough in the jazz industry, between the early 1930s and 1936, Johnson travelled to the U.S. and Tobago to learn from U.S.artists and choreographers like Buddy Bradley and Calypso musicians from the Caribbean. In Tobago, he formed his first all-black dance band that included Dave Wilkins, Carl Barriteau, and David “Baba” Williams, some of whom would work with him again in the UK in the later years (Matera 2015). Johnson’s lack of classical music training allegedly led to a break-up with Thompson in 1937, when “Snakehips” founded the band Ken Johnson and his West Indian Dance Orchestra. It is this move that launched Johnson’s career into international fame. His regular appearances on the BBC are evidence of his growing popularity and his constant hard work. In 1939 he hosted a programme called Calypso and other West Indian Music, aimed at showcasing black talent and broadcasting it overseas beyond the borders of the Mother Country (Bourne 2010, p.93). At the time, the BBC ran the Empire Service, the precursor of the BBC World Service today, targeting audiences in the colonies of the British Empire. 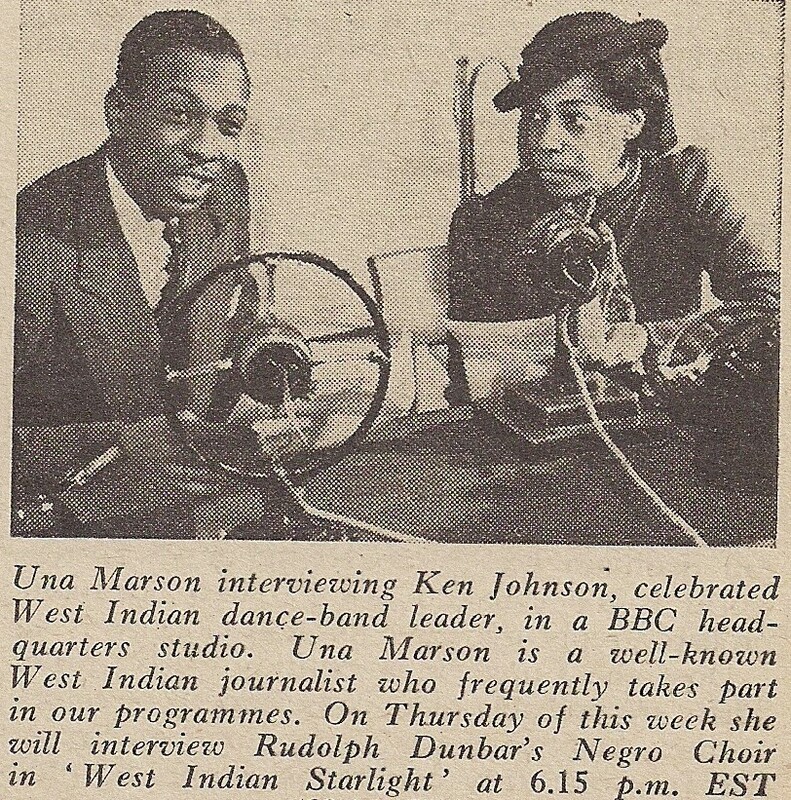 In the interview with Una Marson on Calling the West Indies, it transpires that Ken “Snakehips” Johnson was well aware of his unique position as a black musician in the world of UK’s white jazz (BBC, 2018). While he played predominantly for white audiences, his efforts were part of a larger form of black internationalist solidarity. According to Matera, “even while performing for white, largely upper- and middle-class patrons and, via the radio, a wider British listening audience [Ken Johnson’s band] members continued to have other publics in mind”. The band would record unreleased tracks that would circulate exclusively among black musicians, their friends and their families (Matera 2015). Ken’s “legendary status in British show business” cannot be separated from his Caribbean identity (Bourne 2010, p.92). Matera describes how music and black internationalist activity generated new political imaginaries and solidarities. London was a pivotal centre for such activity in the UK: Johnson’s bands were more than excellent music orchestras (Matera 2015). They constituted a paradigm for the empowerment of black musicians and the creation of performance spaces for his black contemporaries and generations to come. His bands comprised exclusively of black Britons, black Caribbeans and black Africans, the first of their kind in the UK, which allowed for the integration and the popularisation of marginalised black talent in mainstream jazz. When Johnson secured a spot at the iconic Cafe de Paris, he used his platform to showcase London’s most talented black artists, including female singers. In this sense, Ken “Snakehips” Johnson classifies as one of many “musicians and entrepreneurs [who] bridged the worlds of black activism and the jazz club”(Matera 2015). Ken “Snakehips” Johnson was a gay black man. Like many others, his sexuality went unacknowledged until very recently. In 2014, with the publication of Tom Cullen’s work on Gerald Hamilton, Ken’s romantic involvement with the latter was finally confirmed; until then, it had gone simply unnoticed, “discussed in hushed tones, behind closed doors” (Bourne 2017, p.153). Gerald Hamilton, “the wickedest man in Europe”, was Ken’s partner until 1941, the year of Johnson’s death. The two met in 1940 and moved in together at 91 Kinnerton Street in Belgravia, London. Hamilton is remembered historically for “bankruptcy, theft, gross indecency and [for] being a threat to national security”, all aspects that seemed to fascinate Ken, who looked up at the man, 20 years older than himself, and “was amused by [his] Edwardian airs and malicious anecdotes”(Bourne 2017, p.149). All in all, Gerald Hamilton seemed to be an inspiration for Ken to discover his flair for wine tasting, sailing the river Thames and for political dissent, which the former was an expert on. During the London Blitz carried out by the German Nazi forces, the couple moved into a cottage called ‘Little Basing’ by the river Thames in Berkshire, just outside of London. Ken would play at Cafe de Paris at night and sail the river in the morning, after his gigs. Stephen Bourne describes these as “happy times for Ken and Gerald” (Bourne 2017, p.149). The war in 1941 brought a tragic end to Ken “Snakehips” Johnson’s life. He fell victim of a German bomb dropped onto the Cafe de Paris in London. It was the 8th of March, a Saturday. His band was scheduled to play at the underground cafe despite a German blitz happening in the city. Cafe de Paris was thought to be bomb-proof thanks to its location underground; however, when a bomb hit the building above the ground, it caused the whole structure to collapse on to itself and the explosion reached the level below the ground, where Ken ‘Snakehips’ Johnson and his band had just started playing their popular anthem Oh Johnny!. Johnson and another band member were found dead in the aftermath of the bombing (Bourne 2017, p.150). At Johnson’s funeral in 1941, “friends, colleagues, and other mourners gathered[…] at Aggrey House, the social center for students of African descent that had become a base of political organizing” (Matera 2015). Johnson’s impact went beyond the world of jazz. He contributed to the creation and establishment of entertainment opportunities for black musicians. When Johnson’s residency at the Old Florida Club ended in 1938, his band was succeeded by another non-whiteband led by Charles Olufela “Fela” (Matera 2015). Ken “Snakehips” Johnson’s contribution to the world of jazz as a black Caribbean musician and activist can be undoubtedly credited for making possible this tradition of high-status non-white bands. In conclusion, however contested his enrolment at the University of Edinburgh maybe, his story is one that deserves attention from this institution. 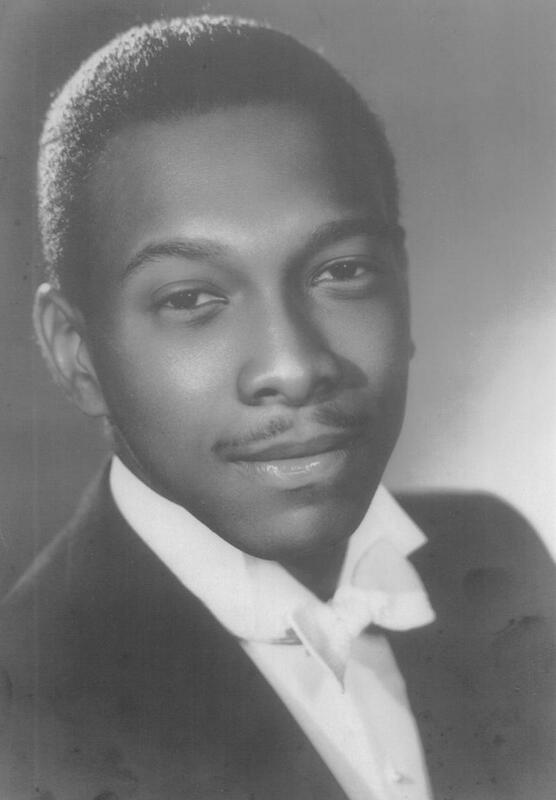 This gay black swing-dancing band leader was a music innovator and an activist who worked hard and played passionately for the amplification of black talent in the UK and beyond. Baird, G, 2010, Ken ‘Snakehips’ Johnson, (2010) West End at War, http://www.westendatwar.org.uk/ (accessed 15/11/2018). Bourne, S, 2017, Fighting Proud: The Untold Story of the Gay Men Who Served in Two World Wars, I.B. Tauris. Matera, M, 2015, Black London: The Imperial Metropolis and Decolonisation in the Twentieth Century, University of California Press.